1 of 2 Heat oven to 400 degrees F. Spread frozen popcorn shrimp on a large baking sheet; spread sliced almonds on medium-size sheet. Bake shrimp at 400 degrees F for 13 minutes; bake almonds at 400 degrees F for 3 minutes. Increase heat to broil. Broil shrimp 3 minutes or until browned and crispy. 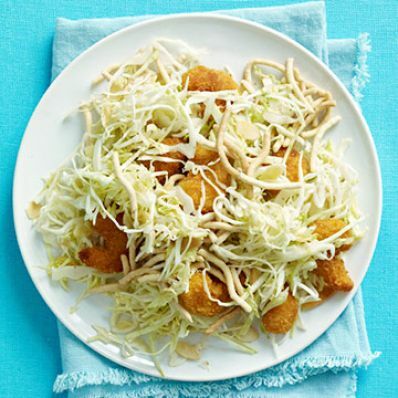 2 of 2 Meanwhile, in a large bowl, toss together nappa cabbage, green cabbage, toasted almonds and miso-sesame dressing. Stir in hot shrimp, top with crispy chow mein noodles and serve immediately.